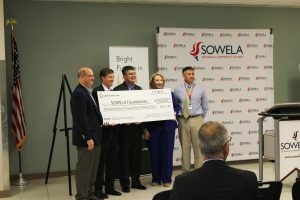 Lake Charles LNG in partnership with SOWELA Technical Community College has provided a $250,000 grant to purchase equipment and introduce new classes required for industry-based qualifications in Process Technology and Industrial Instrumentation. This partnership directly invests in technical education, preparing high school students for good-paying jobs in the liquefied natural gas (LNG) and related industries. The Lake Charles LNG funding will enable Lake Charles Boston Academy students, a Calcasieu Parish School Board campus, to participate in SOWELA’s dual enrollment program. These students will access to industry professionals and career coaches to encourage, inspire, and support their pursuit of higher education and careers in the LNG and related sectors. In addition to providing funding, Lake Charles LNG is planning to implement a Process Technology internship program which will further strengthen the qualifications of SOWELA students interested in pursuing a career in the energy industry. Lake Charles LNG currently employs several SOWELA alumni. We would like to thank Lake Charles LNG for the role they have played in advancing the education and training of our students and for the impact they are making in Southwest Louisiana.